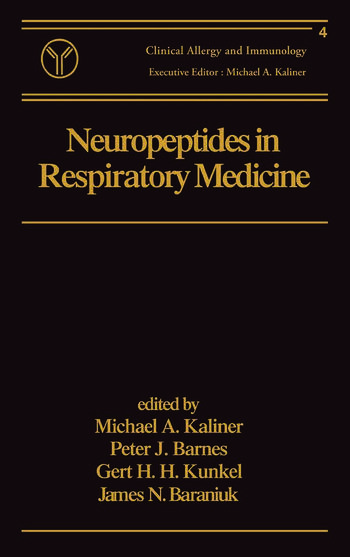 "This outstanding resource offers comprehensive presentations of the latest basic knowledge and the most advanced research on neuropeptides of the respiratory tract covering the structure, receptors, molecular biology, and function of each important neuropeptide and examining how they relate to disease. Demonstrates the utility of immunohistochemistry, autoradiography, molecular biology, smooth muscle contraction, and glandular secretion for the study of neural function both in vitro and in vivo!" Part 1 Innervation of the Airways: Neuropeptides and Classic Innervation - Neural Structures in Human Airways; Functional Autonomic Innervation of the Airways - The Cholinergic and Adrenergic Systems; Neuropeptides in the Lower Airways Investigated by Modem Microscopy; Neural Control of the Upper Respiratory Tract; Peptide Biosynthesis and Secretion - Some Recent Developments and Unresolved Issues; Vasoactive Intestinal Polypeptide in the Respiratory Tract; Neuropeptide Y in the Airways; Sensory Nerves and Tachykinins; Pulmonary Endocrine Cells In Vivo and In Vitro; Molecular Characterization of Autonomic and Neuropeptide Receptors; Autonomic Receptors in the Upper and Lower Airways; Tachykinin Receptor Antagonists; Pulmonary Peptidases - General Principles of Peptide Metabolism and Molecular Biology of Angiotensin Converting Enzyme, Neutral Endopeptidase 24.11, and Carboxypeptidase M; Peptidases in the Respiratory Tract - The Localization and Actions of Carboxypeptidase M. Part 2 Physiological Functions of Neuropeptides in the Airways: The Concept of Neurogenic Inflammation in the Respiratory Tract; Modulation of Neurogenic Inflammation by Peptidase; Control of Airway Vascular Beds; Basophil and Mast Cell Activation - Neuropeptides and Nerves; Inositol Triphosphate and Smooth Muscle Function; Neuropeptides and Airway Macromolecule Secretion; ATP as Neurally Released Modulator of Human Airway Ion Transport; Effects of Neuropeptides on Neurotransmission in the Airways. Part 3 Pathophysiological Contribution of Neuropeptides to Disease: Neuropeptides and Asthma; Inflammatory Mechanisms in Cystic Fibrosis Lung Disease; Allergic Rhinitis; Neuropeptides in Small Cell Lung Carcinoma; Neuroregulation of Pulmonary Immunity - The Roles of Substance P and Vasoactive Intestinal Peptide; Sensory Neuropeptides in an Animal Model of Hyperpnoea-induced Bronchoconstriction; Nitric Oxide and Guanylyl Cyclases - Correlation with Neuropeptides; Neuropeptides in Bronchoalveolar Lavage in Allergic Asthma; Morphology of Neurogenic lnflammation in the Airways - Plasma Protein Movement Across the Airway Mucosa and Epithelium.